recovery. 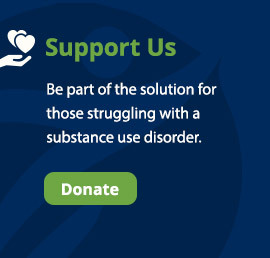 The more tools we can offer them to help their recovery, the better their chances of not only surviving the devastation of substance use disorder, but going on to live healthy lives as productive members of their families and the communities in which they live. Thank you to our partners at Sol Yoga for assisting us in making this recovery tool available to our patients. We are very excited to announce the continuation of our Process Painting Project in 2018. The Process Painting classes are facilitated by Rebecca Laughlin M.F.A. Process Painting is painting experienced in silence, using only tempera paint and paper, during which the painter explores the Creative Process rather than directing one’s attention on how the painting will look when completed. The intent is for the painter to become aware of their True Self as they experience how to quiet the mind that wants to both assign meaning and control the outcome. This unique painting process can be transformative —creativity flows and the unbridled joy of free expression is experienced. Process Painting can be particularly helpful for individuals in recovery from substance use disorders, giving them the opportunity to quiet the mind’s constant chatter and being guided by creative instincts, absent of preconceptions. Women of Wells House @Gale Recovery reported feeling calmer, less stressed, more receptive to people and circumstances, and experiencing a renewed, positive focus on their recovery. Rebecca earned a B.A. in Art Education and a M.F.A. in Painting from American University in Washington, DC. Rebecca completed Master Intensive Training in Process Painting with Michele Cassou, co-founder of the Painting Experience in San Francisco, CA. Ms. Laughlin has been facilitating Process Painting workshops for the past several years in area art centers and at her New Moon Studio in New Market, Maryland. She has been on staff for several years; she is the Financial Administrator for the Wells House @Gale Recovery. We will be offer six-week Music Therapy sessions to our male patients in Frederick. The sessions are be provided by therapists at Noteable Progressions Music Therapy Sessions, led by founder and director Darcy L. O’Daniel (shown here pulling some musical instruments together for a session). Several studies have identified a positive relationship between music therapy and healthy self soothing and a reduction in anxiety, depression and stress among persons in recovery from substance use disorders. Sessions will be held starting in the Spring and extend into early Summer. We thank the Delaplaine for supporting our holistic approach to recovery.